The following table describes the use cases and performance characteristics for each volume type. AWS updates to the performance of EBS volume types may not immediately take effect on your existing volumes. To see full performance on an older volume, you may first need to perform a ModifyVolume action on it. For more information, see Modifying the Size, IOPS, or Type of an EBS Volume on Linux. *** General Purpose SSD (gp2) volumes have a throughput limit between 128 MiB/s and 250 MiB/s depending on volume size. Volumes greater than 170 GiB and below 334 GiB deliver a maximum throughput of 250 MiB/s if burst credits are available. Volumes with 334 GiB and above deliver 250 MiB/s irrespective of burst credits. An older gp2 volume may not see full performance unless a ModifyVolume action is performed on it. For more information, see Modifying the Size, IOPS, or Type of an EBS Volume on Linux. **** Maximum IOPS of 64,000 is guaranteed only on Nitro-based instances. Other instance families guarantee performance up to 32,000 IOPS. † Maximum throughput of 1,000 MiB/s is guaranteed only on Nitro-based instances. Other instance families guarantee up to 500 MiB/s. An older io1 volume may not see full performance unless a ModifyVolume action is performed on it. For more information, see Modifying the Size, IOPS, or Type of an EBS Volume on Linux. †† To achieve this throughput, you must have an instance that supports it. For more information, see Amazon EBS–Optimized Instances. The following table describes previous-generation EBS volume types. If you need higher performance or performance consistency than previous-generation volumes can provide, we recommend that you consider using General Purpose SSD (gp2) or other current volume types. For more information, see Previous Generation Volumes. Linux AMIs require GPT partition tables and GRUB 2 for boot volumes 2 TiB (2048 GiB) or larger. Many Linux AMIs today use the MBR partitioning scheme, which only supports up to 2047 GiB boot volumes. If your instance does not boot with a boot volume that is 2 TiB or larger, the AMI you are using may be limited to a 2047 GiB boot volume size. Non-boot volumes do not have this limitation on Linux instances. There are several factors that can affect the performance of EBS volumes, such as instance configuration, I/O characteristics, and workload demand. For more information about getting the most out of your EBS volumes, see Amazon EBS Volume Performance on Linux Instances. For more information about pricing for these volume types, see Amazon EBS Pricing. General Purpose SSD (gp2) volumes offer cost-effective storage that is ideal for a broad range of workloads. These volumes deliver single-digit millisecond latencies and the ability to burst to 3,000 IOPS for extended periods of time. Between a minimum of 100 IOPS (at 33.33 GiB and below) and a maximum of 16,000 IOPS (at 5,334 GiB and above), baseline performance scales linearly at 3 IOPS per GiB of volume size. AWS designs gp2 volumes to deliver 90% of the provisioned performance 99% of the time. A gp2 volume can range in size from 1 GiB to 16 TiB. The performance of gp2 volumes is tied to volume size, which determines the baseline performance level of the volume and how quickly it accumulates I/O credits; larger volumes have higher baseline performance levels and accumulate I/O credits faster. I/O credits represent the available bandwidth that your gp2 volume can use to burst large amounts of I/O when more than the baseline performance is needed. The more credits your volume has for I/O, the more time it can burst beyond its baseline performance level and the better it performs when more performance is needed. The following diagram shows the burst-bucket behavior for gp2. Each volume receives an initial I/O credit balance of 5.4 million I/O credits, which is enough to sustain the maximum burst performance of 3,000 IOPS for 30 minutes. This initial credit balance is designed to provide a fast initial boot cycle for boot volumes and to provide a good bootstrapping experience for other applications. Volumes earn I/O credits at the baseline performance rate of 3 IOPS per GiB of volume size. For example, a 100 GiB gp2 volume has a baseline performance of 300 IOPS. When your volume requires more than the baseline performance I/O level, it draws on I/O credits in the credit balance to burst to the required performance level, up to a maximum of 3,000 IOPS. Volumes larger than 1,000 GiB have a baseline performance that is equal or greater than the maximum burst performance, and their I/O credit balance never depletes. When your volume uses fewer I/O credits than it earns in a second, unused I/O credits are added to the I/O credit balance. The maximum I/O credit balance for a volume is equal to the initial credit balance (5.4 million I/O credits). The following table lists several volume sizes and the associated baseline performance of the volume (which is also the rate at which it accumulates I/O credits), the burst duration at the 3,000 IOPS maximum (when starting with a full credit balance), and the time in seconds that the volume would take to refill an empty credit balance. * Bursting and I/O credits are only relevant to volumes under 1,000 GiB, where burst performance exceeds baseline performance. What happens if I empty my I/O credit balance? If your gp2 volume uses all of its I/O credit balance, the maximum IOPS performance of the volume remains at the baseline IOPS performance level (the rate at which your volume earns credits) and the volume's maximum throughput is reduced to the baseline IOPS multiplied by the maximum I/O size. Throughput can never exceed 250 MiB/s. When I/O demand drops below the baseline level and unused credits are added to the I/O credit balance, the maximum IOPS performance of the volume again exceeds the baseline. For example, a 100 GiB gp2 volume with an empty credit balance has a baseline performance of 300 IOPS and a throughput limit of 75 MiB/s (300 I/O operations per second * 256 KiB per I/O operation = 75 MiB/s). The larger a volume is, the greater the baseline performance is and the faster it replenishes the credit balance. For more information about how IOPS are measured, see I/O Characteristics. If you notice that your volume performance is frequently limited to the baseline level (due to an empty I/O credit balance), you should consider using a larger gp2 volume (with a higher baseline performance level) or switching to an io1 volume for workloads that require sustained IOPS performance greater than 16,000 IOPS. For information about using CloudWatch metrics and alarms to monitor your burst bucket balance, see Monitoring the Burst Bucket Balance for gp2, st1, and sc1 Volumes. An io1 volume can range in size from 4 GiB to 16 TiB. You can provision from 100 IOPS up to 64,000 IOPS per volume on Nitro system instance families and up to 32,000 on other instance families. The maximum ratio of provisioned IOPS to requested volume size (in GiB) is 50:1. For example, a 100 GiB volume can be provisioned with up to 5,000 IOPS. On a supported instance type, any volume 1,280 GiB in size or greater allows provisioning up to the 64,000 IOPS maximum (50 × 1,280 GiB = 64,000). The throughput limit of io1 volumes is 256 KiB/s for each IOPS provisioned, up to a maximum of 1,000 MiB/s (at 64,000 IOPS). Up to 32,000 IOPS, I/O size can be as high as 256 KiB, while above that a 16 KiB size is used. Your per-I/O latency experience depends on the IOPS provisioned and your workload pattern. For the best per-I/O latency experience, we recommend that you provision an IOPS-to-GiB ratio greater than 2:1. For example, a 2,000 IOPS volume should be smaller than 1,000 GiB. Throughput Optimized HDD (st1) volumes provide low-cost magnetic storage that defines performance in terms of throughput rather than IOPS. This volume type is a good fit for large, sequential workloads such as Amazon EMR, ETL, data warehouses, and log processing. Bootable st1 volumes are not supported. Throughput Optimized HDD (st1) volumes, though similar to Cold HDD (sc1) volumes, are designed to support frequently accessed data. This volume type is optimized for workloads involving large, sequential I/O, and we recommend that customers with workloads performing small, random I/O use gp2. For more information, see Inefficiency of Small Read/Writes on HDD. Like gp2, st1 uses a burst-bucket model for performance. Volume size determines the baseline throughput of your volume, which is the rate at which the volume accumulates throughput credits. Volume size also determines the burst throughput of your volume, which is the rate at which you can spend credits when they are available. Larger volumes have higher baseline and burst throughput. The more credits your volume has, the longer it can drive I/O at the burst level. The following diagram shows the burst-bucket behavior for st1. 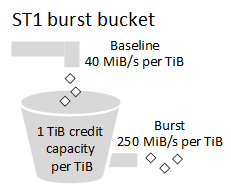 For a 1-TiB st1 volume, burst throughput is limited to 250 MiB/s, the bucket fills with credits at 40 MiB/s, and it can hold up to 1 TiB-worth of credits. Larger volumes scale these limits linearly, with throughput capped at a maximum of 500 MiB/s. After the bucket is depleted, throughput is limited to the baseline rate of 40 MiB/s per TiB. When you create a snapshot of a Throughput Optimized HDD (st1) volume, performance may drop as far as the volume's baseline value while the snapshot is in progress. Cold HDD (sc1) volumes provide low-cost magnetic storage that defines performance in terms of throughput rather than IOPS. With a lower throughput limit than st1, sc1 is a good fit ideal for large, sequential cold-data workloads. If you require infrequent access to your data and are looking to save costs, sc1 provides inexpensive block storage. Bootable sc1 volumes are not supported. Cold HDD (sc1) volumes, though similar to Throughput Optimized HDD (st1) volumes, are designed to support infrequently accessed data. Like gp2, sc1 uses a burst-bucket model for performance. Volume size determines the baseline throughput of your volume, which is the rate at which the volume accumulates throughput credits. Volume size also determines the burst throughput of your volume, which is the rate at which you can spend credits when they are available. Larger volumes have higher baseline and burst throughput. The more credits your volume has, the longer it can drive I/O at the burst level. 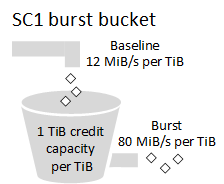 For a 1-TiB sc1 volume, burst throughput is limited to 80 MiB/s, the bucket fills with credits at 12 MiB/s, and it can hold up to 1 TiB-worth of credits. Larger volumes scale these limits linearly, with throughput capped at a maximum of 250 MiB/s. After the bucket is depleted, throughput is limited to the baseline rate of 12 MiB/s per TiB. When you create a snapshot of a Cold HDD (sc1) volume, performance may drop as far as the volume's baseline value while the snapshot is in progress. Magnetic volumes are backed by magnetic drives and are suited for workloads where data is accessed infrequently, and scenarios where low-cost storage for small volume sizes is important. These volumes deliver approximately 100 IOPS on average, with burst capability of up to hundreds of IOPS, and they can range in size from 1 GiB to 1 TiB. Magnetic is a Previous Generation Volume. For new applications, we recommend using one of the newer volume types. For more information, see Previous Generation Volumes. For optimal throughput results using HDD volumes, plan your workloads with the following considerations in mind. The st1 and sc1 bucket sizes vary according to volume size, and a full bucket contains enough tokens for a full volume scan. However, larger st1 and sc1 volumes take longer for the volume scan to complete due to per-instance and per-volume throughput limits. Volumes attached to smaller instances are limited to the per-instance throughput rather than the st1 or sc1 throughput limits. Both st1 and sc1 are designed for performance consistency of 90% of burst throughput 99% of the time. Non-compliant periods are approximately uniformly distributed, targeting 99% of expected total throughput each hour. The following table shows ideal scan times for volumes of various size, assuming full buckets and sufficient instance throughput. For example, taking the performance consistency guarantees and other optimizations into account, an st1 customer with a 5-TiB volume can expect to complete a full volume scan in 2.91 to 3.27 hours. Similarly, an sc1 customer with a 5-TiB volume can expect to complete a full volume scan in 5.83 to 6.54 hours. * These scan times assume an average queue depth (rounded to the nearest whole number) of four or more when performing 1 MiB of sequential I/O. Therefore if you have a throughput-oriented workload that needs to complete scans quickly (up to 500 MiB/s), or requires several full volume scans a day, use st1. If you are optimizing for cost, your data is relatively infrequently accessed, and you don’t need more than 250 MiB/s of scanning performance, then use sc1. The performance model for st1 and sc1 volumes is optimized for sequential I/Os, favoring high-throughput workloads, offering acceptable performance on workloads with mixed IOPS and throughput, and discouraging workloads with small, random I/O. For example, an I/O request of 1 MiB or less counts as a 1 MiB I/O credit. However, if the I/Os are sequential, they are merged into 1 MiB I/O blocks and count only as a 1 MiB I/O credit. As for all Amazon EBS volumes, we recommend that you select an appropriate EBS-optimized EC2 instance in order to avoid network bottlenecks. For more information, see Amazon EBS-Optimized Instances. You can monitor the burst-bucket level for gp2, st1, and sc1 volumes using the EBS BurstBalance metric available in Amazon CloudWatch. This metric shows the percentage of I/O credits (for gp2) or throughput credits (for st1 and sc1) remaining in the burst bucket. For more information about the BurstBalance metric and other metrics related to I/O, see I/O Characteristics and Monitoring. CloudWatch also allows you to set an alarm that notifies you when the BurstBalance value falls to a certain level. For more information, see Creating Amazon CloudWatch Alarms.